Sometimes I struggle with what to snack on that’s healthy and travels well. 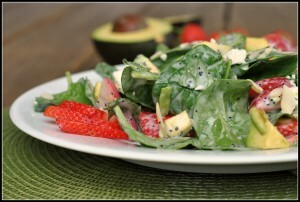 As a rule of thumb, I try and make snacks revolve around fruits and vegetables. I would say that as of late, an apple with low-fat cheese or baby carrots are my go-to snacks. I am one of those weirdos that really likes baby carrots. But I find that most people prefer fruit to snack on as vegetables are more easily incorporated as a side or component of many meals. Since forever, I have loved apples. Regardless of the season, they’re affordable…and the varieties are endless. Who would ever expect variations of the same fruit could have such different flavors? And I hear dehydrators are awesome, too. But I don’t have one of those, and I would venture to guess that most people are in that same dehydrator-less boat. 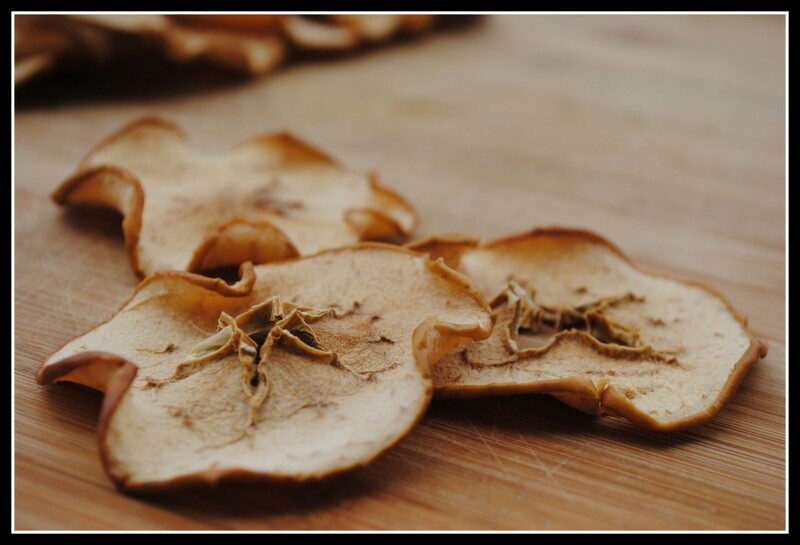 Though here’s some great news — your oven can double as a dehydrator. Yep, that’s right. Purty cool, huh? Preheat oven to 170 F (this is as low as my oven went!). Wash apples and slice to 1/6th inch on a mandoline (this was a “thin” slice on mine). Pick out any seeds from the cores and discard. Mix 2 cups of water with the lemon juice and stir in any sweetened, if you choose to use any. 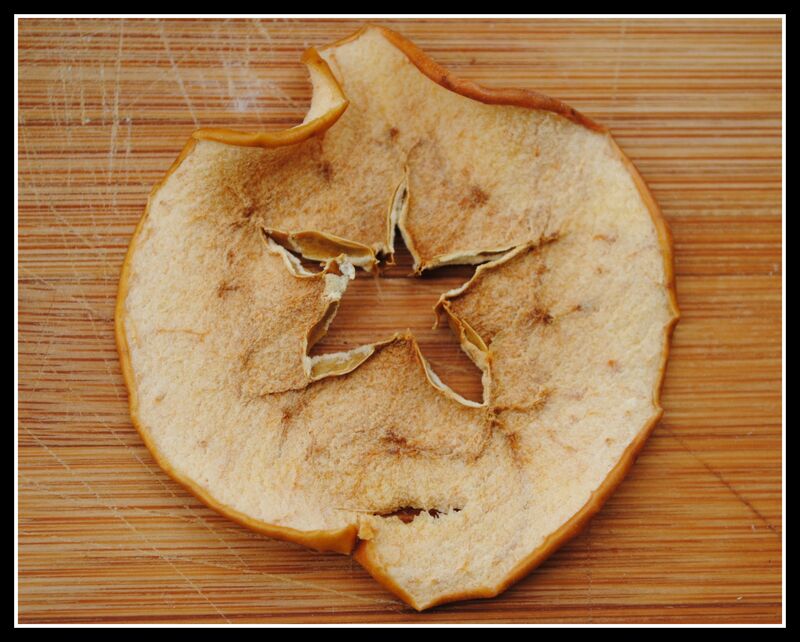 Soak the apple slices in the lemon water for about 5 minutes and then blot dry with paper towels. 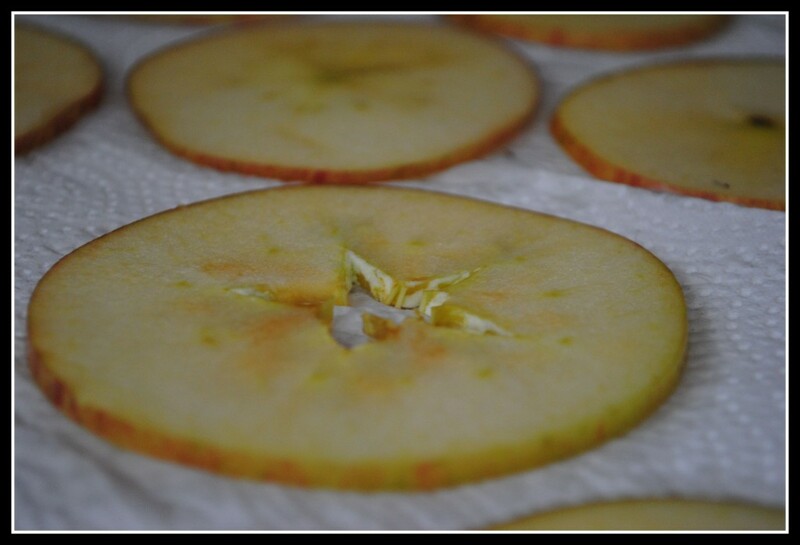 Line 4 baking sheets with parchment and layer the apple slices without overlapping. Bake for 6-8 hours or until desired doneness is reached (there is no right or wrong here). Yield: 4 servings (~16 slices each). Result: We both LOVED these! I wish they didn’t take so long to make, even though they’re very simple. 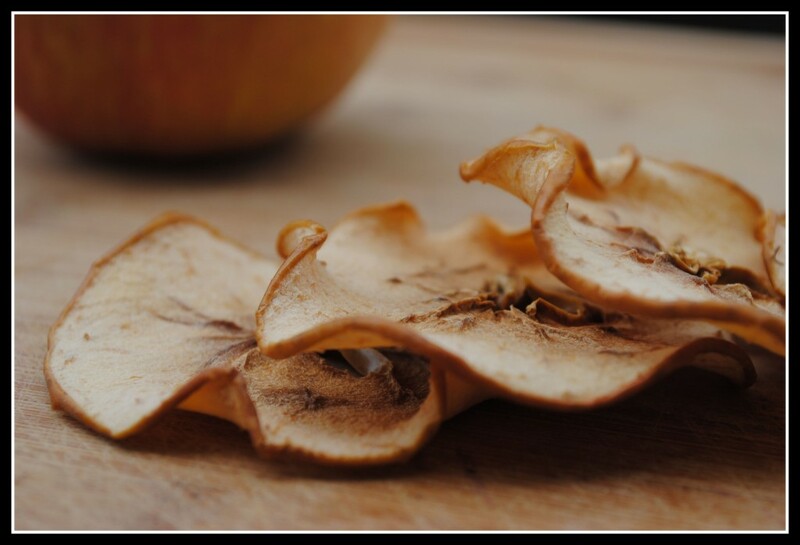 Such a healthy, fun treat…who knew making your own dried fruit was such a breeze? 🙂 Enjoy! Question: What’s your favorite dried fruit? I really wish I could eat apples. Quite honestly, apples have been more difficult for me to give up than garlic, onion, or wheat. I used to eat apples all the time! And everyone keeps telling me apples make any juice taste amazing (when I make my own juice). It’s so sad. Please, feel bad for me. haha, jk. I think if I dried a fruit it would be banana or strawberry. And don’t worry, I like baby carrots too, but I LOVE them cooked! I love making apple chips! Sprinkle some cinnamon on top – delicious! 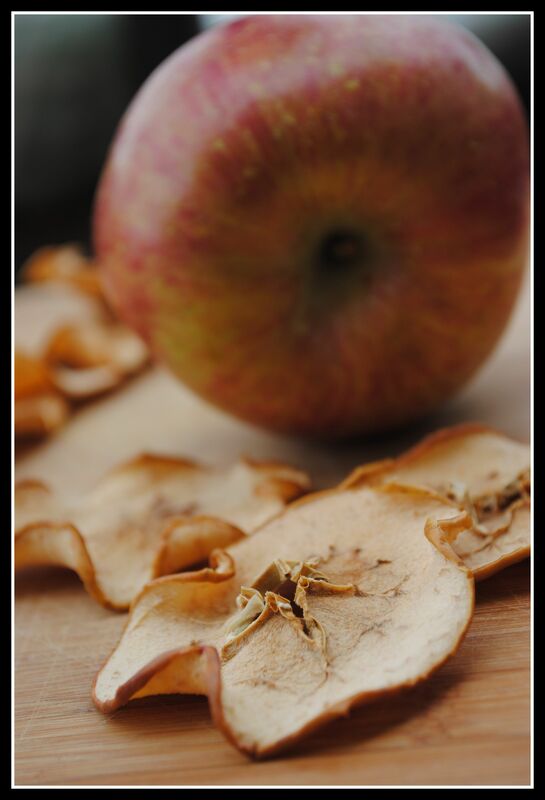 I LOVE dried apples, and can’t wait to try making them myself! I also really love dried mango. Yum!! My favorite dried fruit is mango. Jacob and I both love dried apples. 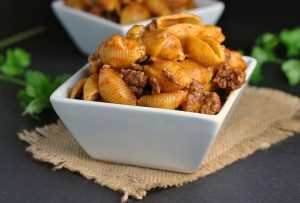 A dash of cinnamon on these would be wonderful too! Totally wishing I had a dehydrator too. I love apple chips, but they are expensive to buy at our local grocery. I am excited to try making my own! Yep, still a bit chewy…especially if you don’t cook them at the longer end of the cooking time. Hi Nicole, I’ve bookmarked this and come harvest time in the fall, I’ll be making them for SURE!!! I’ve dried tomatos in the oven, but haven’t tried fruit. Thanks for the inspiration. Have a FANTASTIC weekend. I love dried strawberries! I think the chew factor is what gets me. I could eat them by the bagfulls! I would have never guessed these would be so simple! Yum! I LOVE dried cherries! YUMM! Can’t wait to try these . Love your pictures ! What’s your secret for such Cool Shots? Thank you! Just practice, I guess! I’ve come a long way in the photography, but I really find it to be more and more so a passion of mine. 🙂 A DSLR helps, too! Couldn’t do it without my Nikon!